Are you looking for camping trailers for rent? If you want to enjoy a RV camping trip with your friends or family members, but no one in your group owns a travel trailer, renting a unit may be the perfect option for you. Renting a camping trailer can be an affordable vacation option for individuals, families, and groups of friends. Whether you're looking for a unique way to create a memorable vacation experience or if you are trying to make up your mind about purchasing a recreational vehicle of your own, renting a camper for your next vacation may be a great option for you. If you enjoy camping but don't travel frequently, it may make more financial sense for you to rent a unit when it's time for you to go on vacation rather than buying one of your own. After all, when you buy a travel trailer, you will spend money purchasing the unit and insuring it, as well as incurring expenses associated with storing and maintaining it. If you only plan to travel occasionally, renting can certainly be more economical than purchasing. Even if you plan to buy your own camper, renting before you buy just might be in your best interest. After all, purchasing a travel trailer represents a significant investment that should not be made lightly. Many times, people who are considering buying a recreational vehicle decide to rent one or more units to try out before making a final purchase decision. This can be a great way to find out if you even enjoy this type of camping and to identify which of the many models of camping trailers best meets your needs. Many companies offer camping trailers for rent. 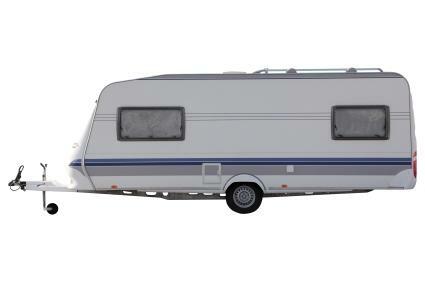 When you are planning to rent a travel trailer, begin by contacting RV dealers in your local area. You may find that some companies known for selling campers also carry rental units. Even if the dealers in your area do not have rentals themselves, there's a good chance they can refer you to local companies that provide what you are seeking. If you're thinking about renting a camping trailer to take on a trip, it's important to consider whether or not you have a vehicle that can tow the type of RV that you want to use. Before entering into a rental agreement, take the time to find out how much the trailer you want to rent weighs and verify that its weight does not exceed the towing capacity for your vehicle. You'll also need to make sure that you have the proper type of trailer hitch, connection for charging the trailer's lights, and electric braking system. If you like the idea of renting a recreational vehicle but you do not have a vehicle and the other equipment necessary to tow a travel trailer, you may want to consider renting a motor home instead. While the fees for renting motor homes tend to be higher than those for camping trailers for rent, you aren't likely to have to spend money renting a heavy duty vehicle or purchasing and installing necessary towing equipment when you choose this option. Alternately, you may want to look for a campground in the area that you want to visit that has rental travel trailers on-site. This option will allow you to enjoy an RV vacation without having to tow the unit yourself. Many KOA Campgrounds, for example, offer Airstream travel trailers that can be rented for on-site usage. It's also not uncommon for privately owned campgrounds to offer site units for rent. If this option appeals to you, you'll need to research and identify facilities that offer what you are looking for and make a reservation in advance of your trip.